text and photos by Fran Kuzui except where noted otherwise. 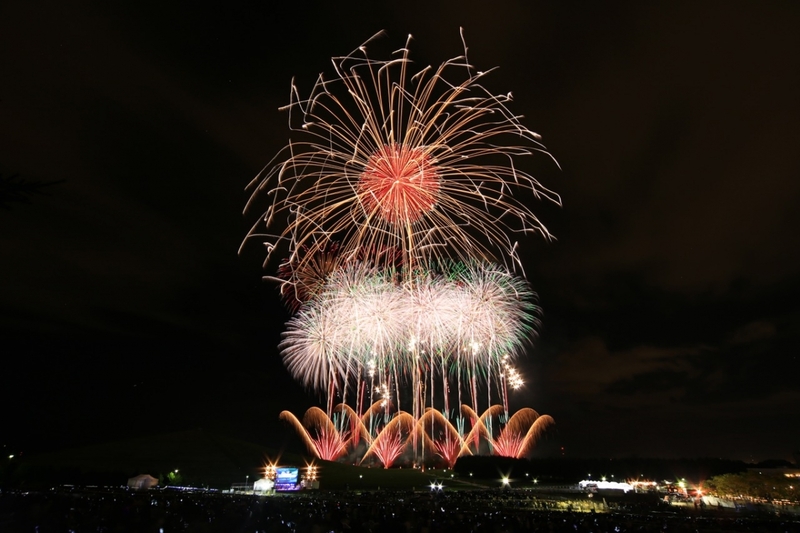 We couldn’t resist the email invitation that heralded the arrival of summer: “Come join us in Kyoto for hanabi fireworks this June.” Within a day, we had booked our shinkansen bullet train from Tokyo and a hotel near Kyoto station. The invitation had come from Makoto Fukuda, a charismatic former rock’n’roll impresario who had managed some top Japanese bands in the 1990s. He retired from the music scene some years ago and began producing hanabi, or fireworks extravaganzas, throughout Japan, virtually as a hobby. We were thrilled to be invited to his biggest performance to date. Fireworks light up the sky over Kyoto. Photo courtesy of Great Art Fireworks. But the real highlight of the dazzling display was what nature presented at a most strategic moment. Just as the fireworks were reaching their grandest peak, the clouds parted and a full moon began peeping out. The audience was transfixed as the moon seemed to compete with the pyrotechnic spectacle and then, as the clouds further receded, the stars came out to dance with the sparklers. Aside from the fireworks extravaganza, we had another purpose for traveling to Kyoto – the pursuit of very different kinds of stars, the kind given for culinary achievement. 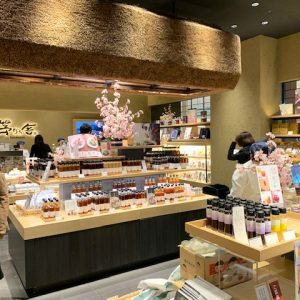 Although Kyoto had an extraordinary 170 Michelin-starred restaurants as of 2018, we’d heard of two outstanding restaurants that had gained a Michelin star each and were known for very simple, locally sourced Japanese food at modest prices. Could this be real, we wondered? “I close at 9:30 p.m. but I’ll wait for you,” Michiyo Matsumoto, the proprietor of Obanzai Hokkoriya, told us when we called to say we wanted to come to her restaurant after the hanabi. “My friend wanted me to go see the fireworks but I didn’t want to disappoint people by closing the restaurant. You need to eat, so come!” Matsumoto’s hospitality and hearty, delicious food have not only earned her a Michelin star for almost 10 consecutive years but have also kept her miniscule dining spot at the top of the list of beloved local drinking spots in Pontocho, Kyoto’s premiere area for informal dining and drinking. 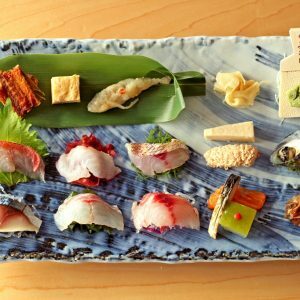 As a gastronomic term, “obanzai” is a form of traditional Kyoto cuisine which features small dishes based on products sourced or processed in the Kyoto area. When you enter Hokkoriya up a flight of stairs, there is very little space between where one removes their shoes and where one settles onto one of 10 cushions in front of Michiyo’s counter where the day’s dishes are displayed in abundance. Guests are encouraged to choose what appeals to them from a display of eight or so ceramic bowls filled with homemade tsumami appetizer dishes. We couldn’t decide among the ones on offer, and asked Michiyo to choose from the seasonal vegetables and other dishes. She served up the freshest of green peas scrambled with eggs, vinegared octopus with cucumbers and seaweed, tofu hamburger studded with ginkgo nuts, succulent grilled chicken, eggplant in a fragrant sauce and skewers of lightly grilled beef. All are somewhat typical of “home cooking,” Kyoto-style, but at Hokkoriya they were prepared perfectly, with some special little twists that were hard to identify. The finale to all the appetizers was a bowl of hot oden, Japan’s answer to the French pot-au-feu and usually served in winter. Hokkoriya’s version is made mainly from fish and tofu, and is loaded with choices from the large, simmering pot that occupies prime real estate along the length of the restaurant’s counter. Michiyo dips in and serves items that catch the diner’s eye, usually three pieces at a time, with spicy mustard. 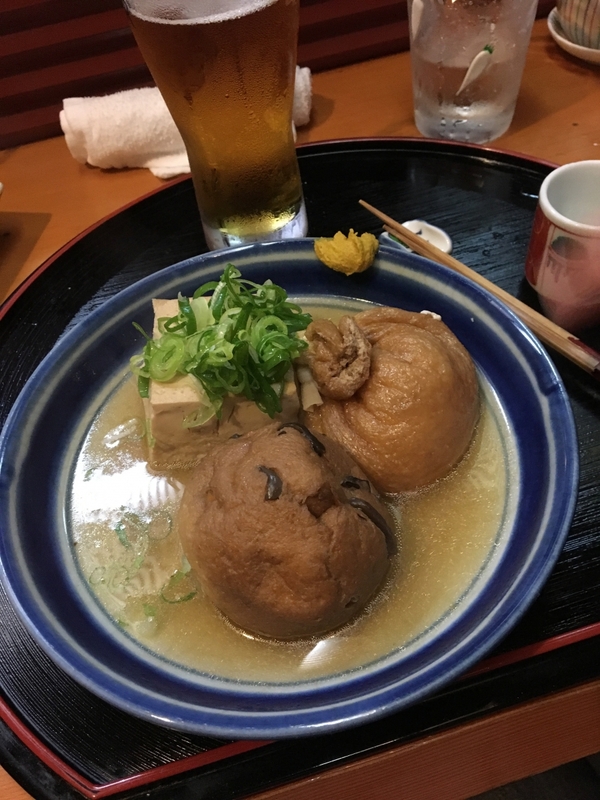 Hokkoriya serves hand-crafted oden that fits perfectly with beer. Further away, in northern Kyoto,chef Koichi Numata pays homage to French abstract painter Nicolas de Stael at his Michelin-starred Sobaya Nicolas. Like his hero, chef Numata aims for innovation and artistry — but he clearly marches to his own beat. He prepares perfect classic soba, buckwheat noodles, with a traditional dipping sauce that must be among the best in Japan. If the soba wasn’t enough to earn a Michelin star, the small-plate dishes have helped maintain the star for Nicolas Sobaya for many years. Sobaya Nicolas offers amazing value with its set meal composed of a trio of small tapas style plates and soba for just Y2,160. We began with that and then added a la carte items. The set appetizers featured strips of chicken coated in a parsley sauce, then blanketed with finely grated Parma cheese, fresh tuna with scallions and a minced fish ball for one diner. The other plate was eggplant with miso, octopus in a pesto sauce and potato salad with lilly bulbs. The treats that followed were baby freshwater ayu fish with sansho pepper, the freshest of cucumbers with Kyoto red miso, a salad of creamy burrata cheese with fruit tomatoes and finally, spring asparagus topped with blue cheese and figs. 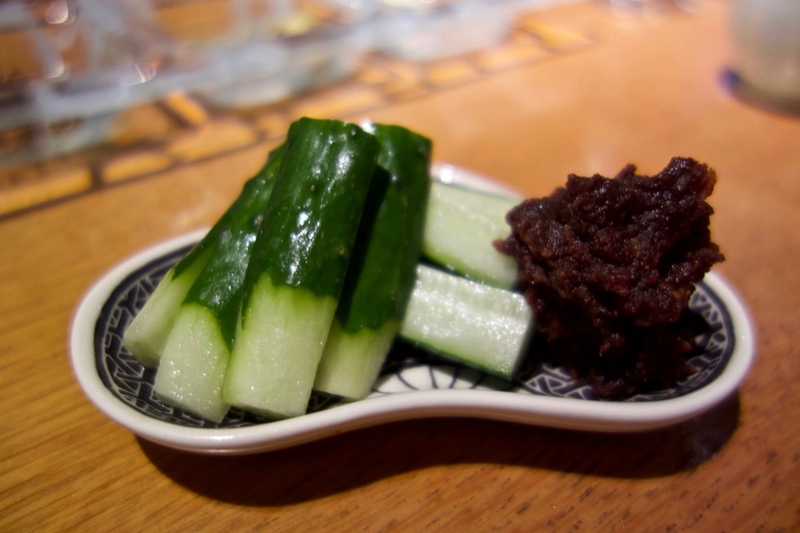 Crisp spring cucumbers pair perfectly with Kyoto miso. 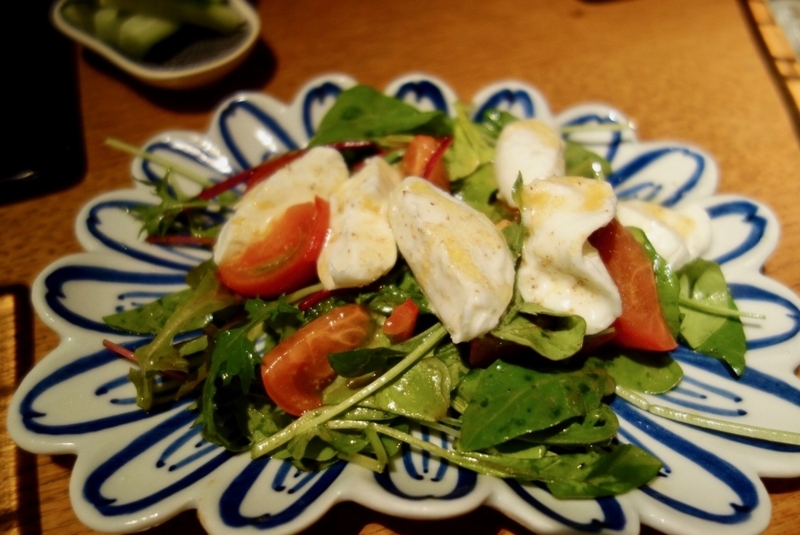 A perfect plate of creamy homemade Burrata and fruit tomatoes on a bed of greens at Sobaya Nicholas. 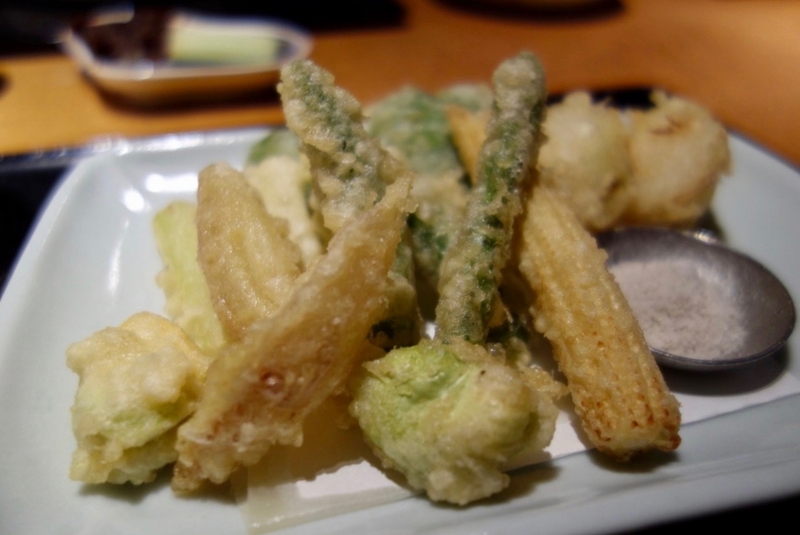 Vegetable tempura dish featuring baby corns, asparagus, fukinoto, or Japanese butterbur scape. We left Kyoto having marveled at the hanabi, enjoyed the gardens and eaten well over two days, yet remaining within our budget for the trip. A train trip to northern Kyoto between meals to see Kokedera temple’s famous moss garden as it turned green from spring rains was another highlight of the trip. It is always a treat to see the garden in the fall when the maple trees put on a dazzling show of red and yellow. 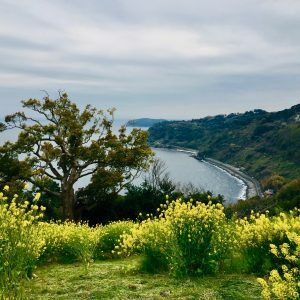 While Kyoto’s restaurants served flawless fare and Fukuda-san strutted his exceptional pyrotechnic talents, this time, we were reminded when seeing the new spring green of the gardens, how nature often provides the best show on earth. Open : 5 pm to 9.30 pm (last order at 9 pm). There will be two more hanbi performances in Nagoya (10/13/18) and Sapporo (9/8/18) this summer.